The Beautyrest Cotton Rich Mattress Protector is filled with five ounces of Adjustaloft® fiber that adjusts to your body to provide support during sleep. The cotton and polyester material provide ultra-soft texture to help you for uninterrupted sleep. 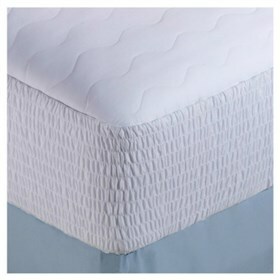 The protectors Smooth grip feature keeps pad steady on top of your mattress to provide protection. The Beautyrest Cotton Rich Mattress Protector - King S has many exciting features for users of all types. The Beautyrest Cotton Rich Mattress Protector - King S is sold as a Brand New Unopened Item.